Today I am bringing you something not really nail polish-y, BUT, cosmetic-y that still does tie in with nail polish - you'll see!! I am going to talk about the Luxe Box by Loose Button.. Last month I received my first box from them, but I didn't blog about it, but I did film a VIDEO. This time I decided to snap photos as I opened it so I could share it with all of you!! During the month of May, I kept seeing mentions of something called a Birch Box.. Of course I had to look in to it.. I was so excited!! Deluxe make-up samples sent to you every month?! For $10?! SIGN ME UP! But, of course, they do not ship to Canada. Lame. I didn't stop my quest there. I googled for a Canadian equivalent... and found one! 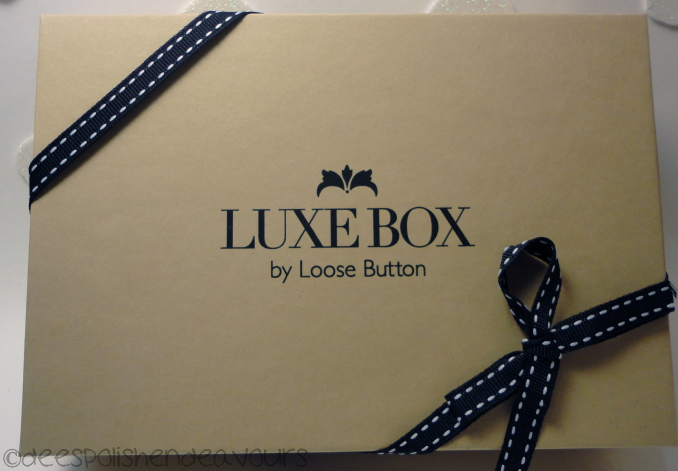 It was Loose Button that introduced me to the Luxe Box! At the time, you had to sign up and be sent an invitation email to join. I received one within 24 hours and I put my order in for June, July & August. I also get to be a part of the 'founding members' section, so that is kind of neat as well. Moving onwards.. I have been counting down the days since my last box was delivered. I was happy when my sister told me that it had arrived today.. Right after work (aka NOW) I snapped some photos and wanted to share with all of you asap! If you're Canadian and are still waiting for yours and don't want the surprise ruined, x out now! Or, if you want spoilers/are just curious, continue on! Also, apparently, you lucky Americans will eventually get a chance to get your mitts on these gems as well. Not going to lie, if Birch Box ever became available to us, I would order both.. I'm like that! This is what you're first looking at.. Gorgeous packaging.. And this time I didn't cut off the ribbon when cutting open the bubble packaging! Yay me! Then, once you remove the lid, you see the little "notes". I really like that it is personally addressed to you.. And that they spell my name correctly. Nothing bothers me more than when I fill out forms, and my name is still spelled incorrectly! Thank you Loose Button! The little letter just mentions great products for the month and that they will contact you later to get feedback.. Then the note will give some information on the products you have received for the month.. I took two shaky photos of the note. They are quite blurry, so I will just tote down the information after the product photos! Essie Nail Polish in Silken Cord: "Today Essie Nail Polish has grown to be one of the industry's most popular professional polish brands. Due to Essie's long-lasting formula, Essie Nail Polish has been worn by many celebrities including Princess Kate Middleton on her wedding day." - Really? Well, despite almost throwing up with Kate Middleton being brought up (seriously, the Royal Wedding biz has been really annoying! 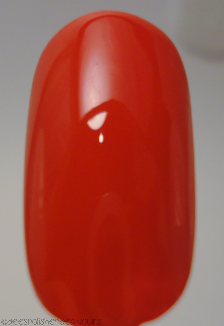 ), I was still happy with the polish! Nice colour too. Next is a product by Proclaim, and it is Hair Oil Treatment: "Proclaim Argan Oil Hair Oil Treatment is uniquely formulated with Argan Oil and natural ingredients that condition, help repair dry, damaged hair without weighing it down, eliminate frizz and infuse brilliant shine." - I already use Moroccan Oil (same stuff) - so I know I will love this item! The stuff is incredible!! 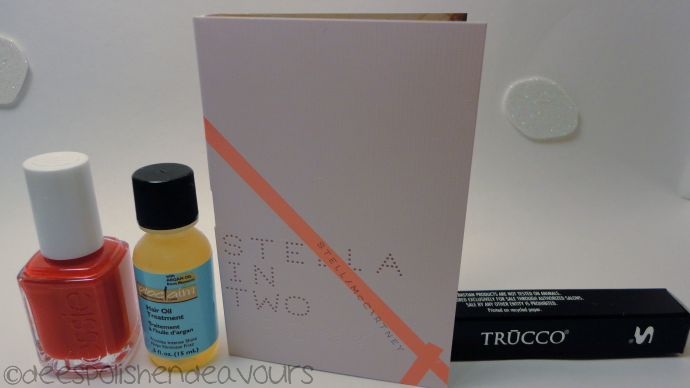 Then it is a Stella perfume called Two Peony Fragrance: "Light and sparkling Pink Peony spiced up with black pepper comprise the top notes, while the base notes of amber, cedar wood and patchouli leave a warm and decidedly sensual dry down. A great spring/summer choice to add to your fragrance collection." - I smelt the bottle but didn't actually spray it yet.. I didn't like the scent, but maybe that will change once I actually legitimately try it.. It smelt too "adult" for my likings. I like sweet/fruity scents. Ehh.. If it doesn't work, the mother can have it! Lastly, there is a product by Trucco and it says Pro Lip Liner: "Pro Lip Pencil can be used to sculpt, color, outline, and reshape the lips. Outline lips before applying lipstick to create shape and help prevent lipstick from feathering. Or use this product to fill in the entire lip as a base for lip color." 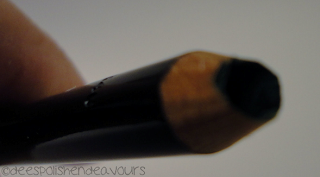 - I was really excited about the lip liner! I have one that I love (from a different brand) so I have never felt the need to have another kicking around.. But if it is SENT to me.. That is another story.. I check the name.. It is called 'Ivy'.. Weird name for a lip liner, right? Ohh.. sadface, that is because it is an eye liner instead. AND it came like this..
After a quick sharpen, I was able to swatch it. It is a gorgeous green (this coming from someone that thinks every shade of green is gorgeous!) - yeah, it might not be a lip liner (for me, anyways..) but I am still happy with it! 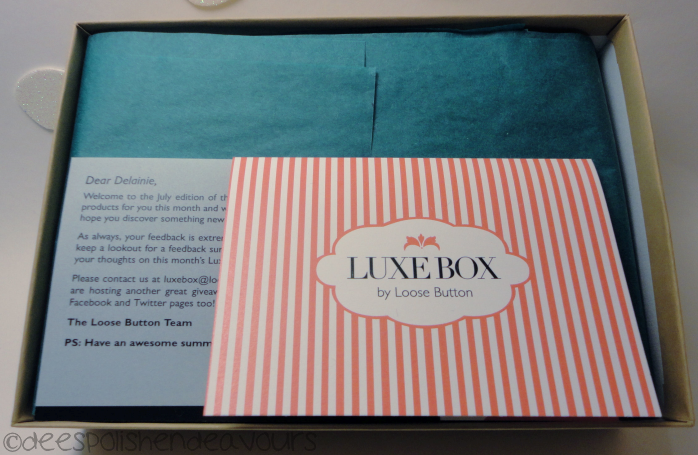 All in all, I am very happy with my Luxe Box this month! Now to wait patiently for August. I am going to be trying to French Manicure up my nails this evening.. For practice purposes! My good friend is a bridesmaid in her friend's upcoming wedding.. She wants all her bridesmaids to have French Manis.. She asked if I could one for her (saves major $$ from getting it done at a salon!) - of course I never sport them, but I can try! Any tips!? The Nail Buff - Thanks! I thought so too.. I mean, I love me some full out animal print, but sometimes little hints here and there are pretty classy as well!! Minty - Me too! And thank you! Halifax @ Sparkled Beauty - Apparently.. I will go back to the salon I bought them at during the sale.. I can check out what they have in there and let you know!! Claire - Thank you, me too! It got a wealth of compliments! !